George de Leyens developed the hive that bears his name over several decades, based on his observations of the natural behaviour of bees and the principle of minimal intervention, typically 2-3 visits a year. The hive uses moveable frames 340mm wide x 440mm tall (approx 13″ x 17″). The top bars are butted together to help retain heat inside the brood nest. This height of frame allows the bees to move upwards without hindrance during the winter cluster, as they would naturally in a wild colony, and also allows the colony ample room for expansion. Frame spacing is conventional with 14 or 20 frames arranged horizontally, hence the description of ‘long hive’. 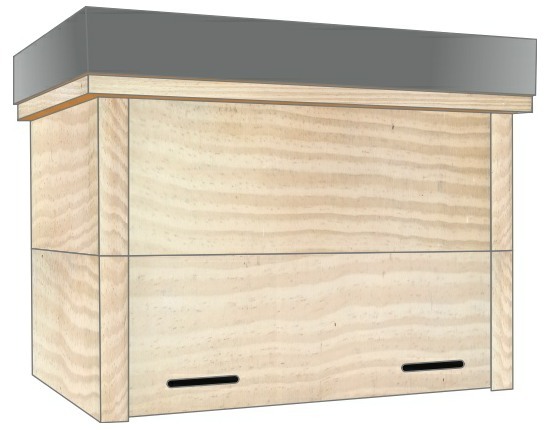 There are many variations on the basic hive design due to its simplicity. The hive is made from timber up to 32mm (1¼”) thick reputed to give the hive better over-wintering qualities. Legs are usually provided to bring the hive to a comfortable working height for the beekeeper. There are also two entrances provided at opposite sides of the hive to enable different management strategies. De Leyens advocated a visit during the early part of the year to stock the hive with frames and a further visit in the autumn to remove honey. This was before the arrival of Varroa mites. However, devotees of the hive claim that the lack of disturbance enables the bees to cope with the parasite adequately. The table below gives figures for the 14 and 20 frame Leyens hives for comparison with a Dartington hive using National 14 x 12 frames. All brood figures are approximate. George de Leyens’ book, Keeping Bees in Horizontal Hives – A Complete Guide to Apiculture was written in 1897 and has been translated and re-printed in 2017 with many of the original drawings. There is a copy in the East Devon Beekeepers library for those who may wish to aquaint themselves with the principles of his hive management. The two major principles are : using local bees and keeping them in appropriate hives that are gentle on the bees and the beekeeper alike, and require minimal management. The USA and Spain both have large numbers of Leyens hives today.